When is your community’s Beggar’s Night? 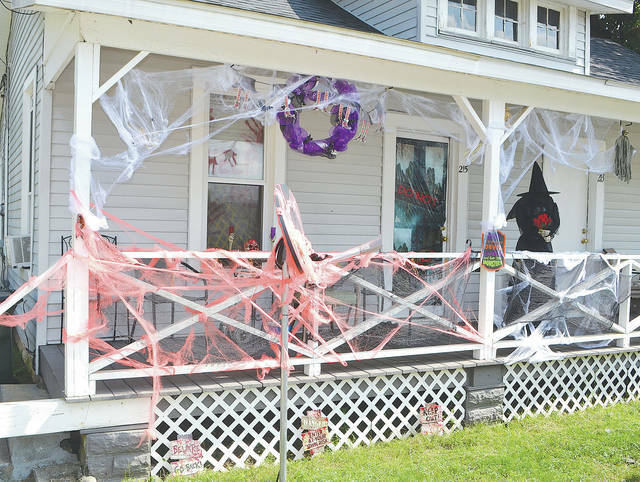 The owners of the apartment house at 215 N. Kenton St. in Urbana are ready for Halloween. Beggar’s Night in Urbana is Wednesday, Oct. 31 from 6-8 p.m. Other municipalities have also set their dates and times for Beggar’s Nights. The Champaign County Sheriff’s Office has released a list of Beggar’s Night events around the county. -St. Paris from 6-8 p.m.
-Terre Haute from 5-7 p.m.
-North Lewisburg from 6-8 p.m. The Champaign County Sheriff’s Office will be increasing patrols during these periods and deputies advise all involved to travel with care. 1. Cross the street at corners, using traffic signals and crosswalks. 2. Look left, right and left again when crossing and keep looking as you cross. 3. Put electronic devices down and keep heads up and walk, don’t run, across the street. 4. Teach children to make eye contact with drivers before crossing in front of them. 1. Children under the age of 12 should not be alone at night without adult supervision. If kids are mature enough to be out without supervision, they should stick to familiar areas that are well lit and trick-or-treat in groups. 1. Decorate costumes and bags with reflective tape or stickers and, if possible, choose light colors. 2. Choose face paint and makeup whenever possible instead of masks, which can obstruct a child’s vision. 3. Have kids carry glow sticks or flashlights to help them see and be seen by drivers. 4. When selecting a costume, make sure it is the right size to prevent trips and falls. 1. Slow down and be especially alert in residential neighborhoods. Children are excited to trick-or-treat and may move in unpredictable ways. 6. Popular trick-or-treating hours generally occur around dusk, so be especially alert for kids during those hours.